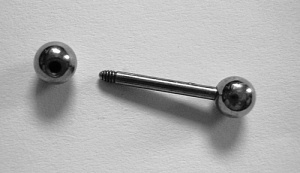 Tongue piercing can be a risky business, which is why you need to approach a professional to get the work done. You should be willing to endure a little pain as well. The tongue will swell once the barbell is pierced into the tongue. Usually, the tongue swells after few hours of piercing. After the piercing is done, you will be advised to stay on a liquid diet for few days. This is a must to ensure proper healing. The healing process might last for 2 weeks. Let’s have a good look at the aftercare required for tongue piercing in order to stay immune from potential health complications. One of the aftercare basics involves rinsing one’s mouth with Listerine several times in a day. This is a must to avoid potential infections. Although you might experience a burning sensation while rinsing your mouth, you should not skip this step. Until complete recovery, you will experience swelling on your tongue once you wake up in the morning. The blood rushes to our head when we lay down, which eventually causes our tongue to swell. One is advised to sip cold water every morning after waking up. Another alternative over here would be to eat ice cream. During the initial weeks, one should avoid solid foods. Your diet must comprise of soft foods that require less chewing. Besides this, one must avoid hot and oily foods. One can consider inclusion of rice, bananas or soup in their diet. Also, one must rinse their mouth properly after each and every meal. As mentioned earlier, tongue swelling is a natural thing that you will have to endure after undergoing tongue piercing. While you might feel tempted to touch your tongue, you should avoid doing so. The risk of getting infected is high, especially when your hands are not clean. Smoking is a strict “no” after tongue piercing. However, if you smoke, you must rinse your mouth properly before and after you smoke. As much as possible, avoid cigarette or any other nicotine product. Individuals are advised to avoid alcohol during the healing period because it will slow down the healing process. Likewise, intake of coffee can also slow down the healing process. If the swelling doesn’t decrease after 10 days of undergoing tongue piercing, individuals are advised to pay a visit to their physician. Chances are that you might have contracted some kind of infection, which is why the swelling hasn’t decrease. The doctor will prescribe certain medications to deal with the situation.